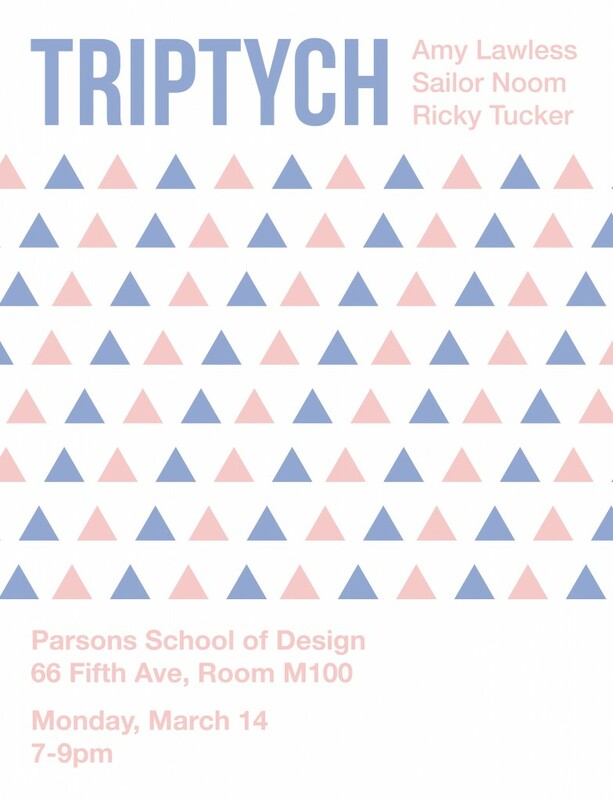 Triptych is a monthly reading series in the Book Arts Room at Parsons School of Design (66 5th Avenue, room M100). Join us for the second reading of the season on Monday, March 14, 7-9pm with Amy Lawless, Sailor Noom, and Ricky Tucker. Amy Lawless is the author of two books of poems including My Dead (Octopus Books). Her third poetry collection Broadax is forthcoming from Octopus Books. She is also co-author of I Cry: The Desire to Be Rejected, a collaborative, hybrid book with Chris Cheney just out from Pioneer Works Press. Her poems have recently appeared or are forthcoming in jubilat,The Volta, Washington Square Review, Best American Poetry 2013, and the Academy of American Poets’ Poem-a-Day: 365 Poems for Every Occasion. She received a poetry fellowship from the New York Foundation for the Arts in 2011. Ricky Tucker is a North Carolina native, fiction writer, editor and art critic. His work often explores the imprint of art on narrative, and how form bends content. He received his B.A. from The New School as a Riggio: Writing and Democracy scholar, and a writing/teaching M.A. at Goldsmiths, University of London. He was recently shortlisted for the Masters Review Emerging Writers Prize, and this fall his creative non-fiction can be found in the New York based magazine, The Tenth, and the London literary Journal, Different Skies. Sailor Noom is a video artist and poet living in Brooklyn NY. She recently curated a two-gallery video show at Parsons and Lang College at The New School called Digital Diaspora Winter. She has most recently performed at Judson Memorial Church as part of the Movement Research Project and as a participant in Lior Shvil’s work “protocols” at Performa 2015. She has gone from performing within her own work to collaborating with other performers in video scores she facilitates through language and story telling. She is currently in her last semester of the BAFA duel degree program studying Fine Art and Screen Studies at the New School.